These Peanut Butter Swirl Brownies are thick, fudgy, and filled with a creamy peanut butter swirl and topped with peanut butter cups. Soft, chewy, and bursting with flavor, this simple dessert will satisfy your brownie cravings and have you coming back for more! Have I ever mentioned that I used to never be a big fan of brownies? I know, I know…crazy, right? Well, let me clarify. 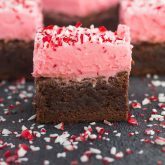 I have always liked brownies, but when I was younger, I would gladly pass up brownies for a cookie, muffin, or just about any other sweet treat. I’ve also mentioned before that I don’t have the biggest sweet tooth, though my tastes have definitely evolved as I’ve gotten older. Now, I eagerly look forward to munching on a donut, muffin, slice of cake, and brownies. Yes, brownies! You may remember these Brownie Bites with Nutella Frosting from a few months ago. That was my second brownie recipe that I’ve shared on Pumpkin ‘N Spice, and probably one of my favorites. I mean, brownies…need I say more? I’m SO glad I came around to loving them! And while homemade is always good, sometimes you just need something easy, yet delicious. After all, I’m all about the simple recipes around here (hence my motto at the top of the page: Where Easy Meets Delicious!). If you’re looking for the perfect, easy dessert, then you’ve hit the jackpot. Trust me, friends. 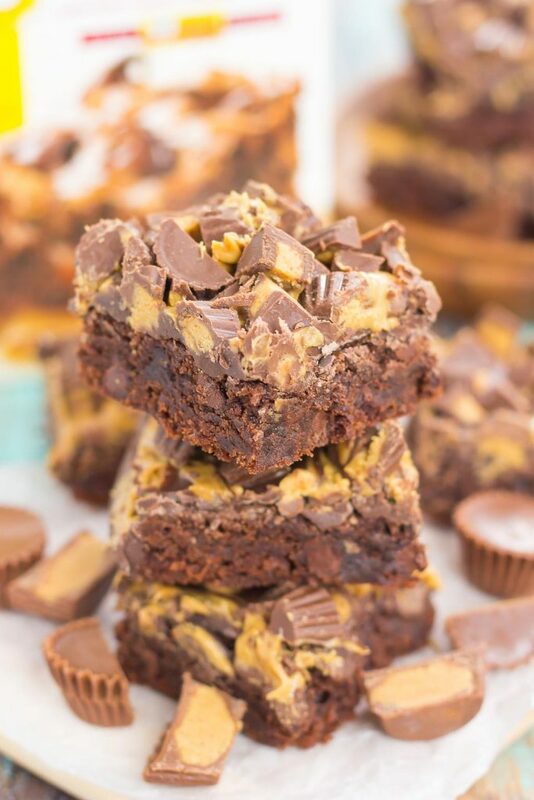 I mean, peanut butter and brownies…could it get any better than this? You all know I love peanut butter, so it only seemed natural to combine it into this simple, one bowl, dessert. These Peanut Butter Swirl Brownies are loaded with flavor. 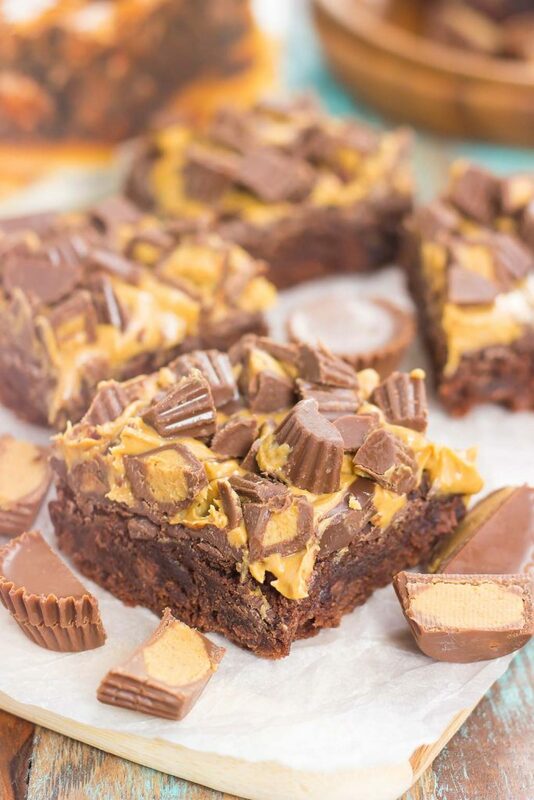 A chocolate brownie base, with chocolate morsels, peanut butter, and peanut butter cups…wowsers. Definitely the perfect, easy brownie! Like most of my recipes, these Peanut Butter Swirl Brownies are a breeze to whip up. The brownie mix is made in one bowl and then popped into the oven to bake. Once the brownies have cooled, it’s time to swirl on some chocolate and peanut butter. Simply melt some chocolate wafer (or chips) in the microwave and then spread on top of the brownies. Then, it’s time for the peanut butter! Melt the peanut butter slightly in the microwave so that it’s easy to spread, and then drop by the spoonful on top of the chocolate. Swirl with a knife and then top with peanut butter cups. Easy peasy, right? One bite and you’ll fall in love with the rich chocolate and peanut butter explosion. The soft and chewy texture, combined with the decadent flavor equals pure perfection. Easy to make and even better to eat, these Peanut Butter Swirl Brownies will be your new, go-to dessert! Preheat oven to 325F. Line an 8x8 baking pan with foil or parchment paper, letting hang slightly over sides. Lightly grease with non-stick cooking spray. Set aside. In a large bowl, prepare and bake the brownies according to package directions. Allow brownies to cool completely once out of the oven. In a medium, microwaveable safe bowl, melt the chocolate wafers (or chips) until smooth and creamy, stirring every 15 seconds so mixture doesn't burn. Spread melted chocolate evenly over top of brownies. In a small bowl, heat peanut butter for about 10-15 seconds, or just until it's slightly melted and easier to spread. Drop peanut butter in small spoonfuls over chocolate frosting. Using a butter knife, gently swirly to create a marble affect.Top with chopped peanut butter cups. Let brownies set until frosting has slightly hardened. This is a nice recipe, that i have now put on my to-do list, thanks for sharing. Thanks for the kind words and for stopping by, Jane! Oh Gayle, what are you doing to me?! I have just had to ban myself from eating peanut butter and then I see this haha. They look epic! Peanut butter and brownies make the best combo, don't they? Thanks, Dannii! Now THIS is my kind of baking -- the recipe that starts with a mix! 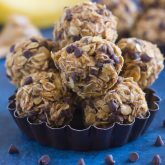 :) Your chocolate-peanut butter treats sound AMAZING, Gayle! Yes! Sometimes easy recipes are needed. Thanks for the brownie love, Blair! 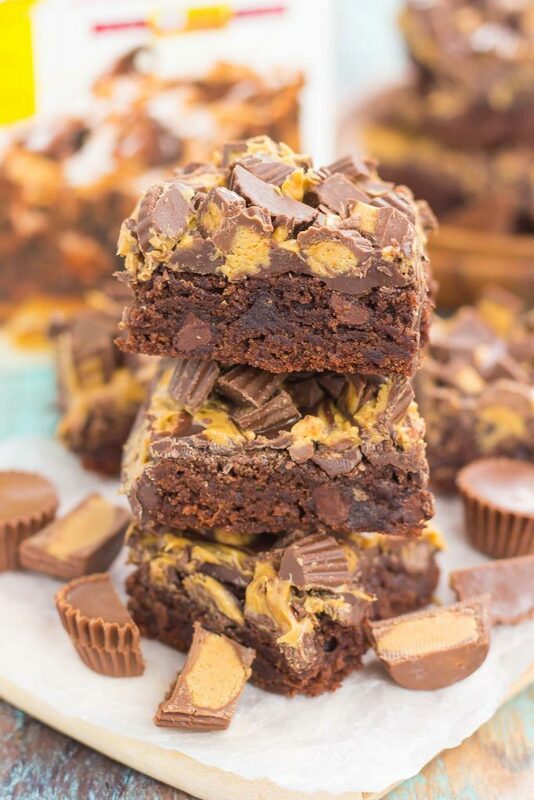 Oh gosh, I am ALL about peanut butter cups so these gorgeous brownies are right up my alley! I mean, I'm totally swooning over all that layer-y goodness! Perfect kinda food for getting through that mid-week slump! Thank you, Sarah! I agree, brownies are much needed this week! Gayle, I feel the same way about brownies .. but top them with Reese's mini peanut butter cups and I'm grabbing all the brownies!!! can't wait to check out the new Nestle Toll House Baking Mixes!! Thank you, Alice! Peanut butter makes everything better! :) And I think you'll love those baking mixes! I want alllllllll these brownies ????. Chocolate and peanut butter = SO delicious! Thank you for the brownie love, Keri! Peanut butter and chocolate is where it's at and especially when it comes to brownies- yum! Oh my goodness, do these look amazing or what? I LOVE thick and chewy brownies! Peanut butter + chocolate = a match made in heaven! I'm in heaven just thinking about these brownies!! YUM! The peanut butter queen strikes again! You can't go wrong with peanut butter and chocolate! I was thinking I need to try this mix, since I also got all 4 of them! Can't wait to try these brownies! They look and sound amazing! Thanks for the brownie love, friend! I love how easy these are, too! Thanks, Kelly! Oh my goodness... these are SO over-the-top and SO enticing! I love peanut butter and chocolate (I mean, really, who isn't?) and so this just looks perfect. So pretty too! Man! I don't think I have ever been more sad about my food allergies and intolerances- ha! I want these!!! Aww sorry to hear that, Gigi! Thanks for the brownie love, though! That's how we differ, Gayle. I have like 70 brownie recipes on my site, and you have three, whereas I never post anything but dessert. And we're still blog buddies! :) These are seriously the most incredible thing I've seen this week. I'm making them STAT! Haha very true! I guess we balance each other out, right? :) Thanks for the brownie love, friend! Too funny! Brownies were always my favorite growing up - probably because my mom would let us lick the bowl!! lol These look and sound fantastic! I can never turn down peanut butter + chocolate! Licking the bowl was the best! :) Thanks, Ashley! Okay, these brownies are everything! 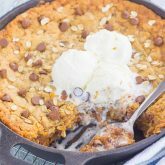 Love all that peanut butter on top! No one can resist chocolate and peanut butter! I'm dying to try these! Ugh darn your cocoa allergy! :) I would've gladly given you all of my brownies when back when! Thanks for the kind words and pin, friend! 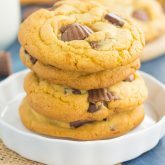 I am all up for easy recipes like this, these look so delicious! 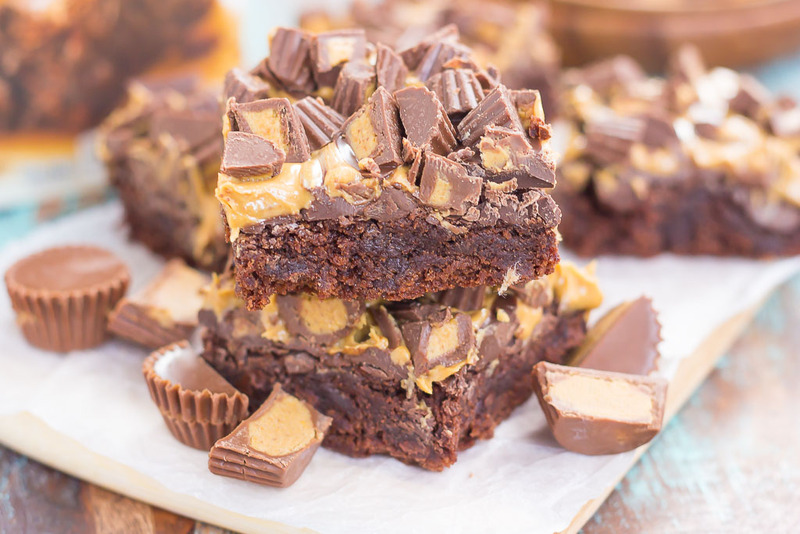 I love brownies, and peanut butter makes them even better! These look so good, Gayle! Thank you so much, Demeter! I'm glad I came around to brownies too...not sure what was wrong with me back then! :) Hope you have a wonderful weekend, too!